Whether it be the look, the sound, or the sheer glory of owning a Gibson electric guitar you are after, it doesn't matter because as the artist, your music will be best when you play with an instrument you have supreme confidence in. 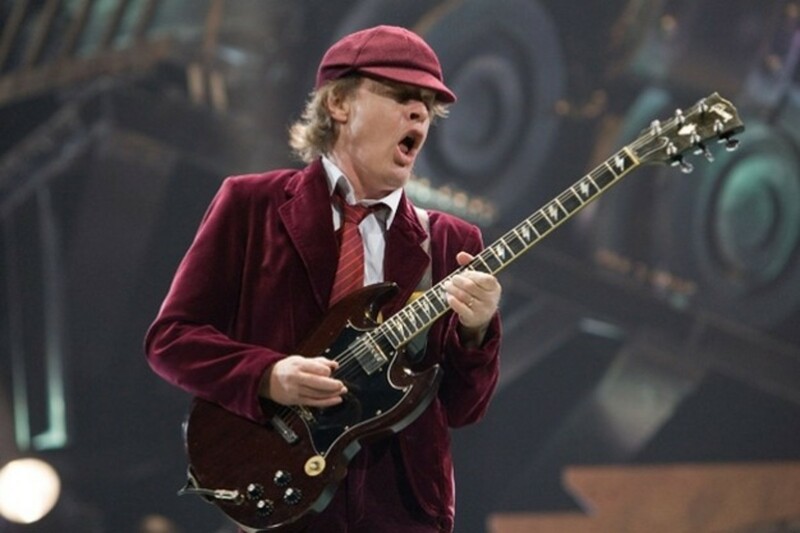 Gibson's reputation is global, and the music made on Gibson electric guitars is as well. But times are hard, and maybe fancy inlay and binding aren't so important to you. To me the biggest seller in a guitar is how the thing feels. You buy a guitar with the intentions of holding the thing in your hands for countless hours of work and joy. It is damned important you've got a guitar that feels just so in your hands. 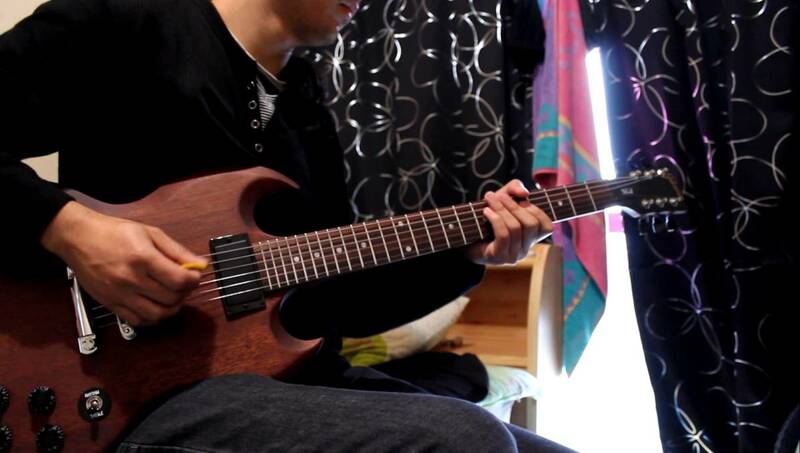 The Gibson SG feels great in my hands. The SG isn't so heavy. I like the tune-o-matic and stop bar bridge, saddle, and tail piece assembly. Holy smoke, or hell fire, are those angel wings or devil horns so visible in the SG's shape? I guess it depends on your interpretation of the moment, the thing looks terrific. The norms for US made guitars priced to sell at under one thousand dollars new are the instrument is less fancy in appearance. That's the primary thing, you get less inlay and less in the way of binding. To me the SG looks great with the dot fretboard positioning markers. I think I may prefer the looks of the dots over the trapezoid inlays. You do not usually get coil splits in a Gibson under one thousand dollars. The sound Gibson is most identified with isn't the sound of a split coil anyway. There is a certain level of cool one attains by using a simpler guitar to play great music. I'm all for coil splits and coil taps; but using so much fancy stuff can distract from the real artistry of utilizing your hands to manipulate tone. Gibson's more expensive SG guitars use a nitro lacquer which looks fabulous, but adds some cost to the instrument which may not be worth the extra cash to you. The less expensive SGs, especially ones noted as faded, come with the appearance of a guitar which has been played continually for years and years. The aged look is actually quite nice, as it causes you to look like a guitar playing warrior who's been in many a battle. People are paying extra in places for guitars which look old. If you are like me and can imagine coming up with some funds to buy a Gibson SG, but you can't imagine having more than a thousand bucks to spend on it, then this page is for you and me both. I'll compile here the most recent models of Gibson SG which sold new for under one thousand dollars. So on that fine day when we head off to the big guitar store, or to amazon dot com, we'll have our information ready in our minds on what to look for and what it should cost. The Gibson SG J has been called one of the best kept secrets of all Gibson electric guitars. Here you have all the essential elements of a Gibson SG, minus all the frills. There are no bells or whistles here, just a simple solid body electric guitar with great build elements, well respected Gibson pickups, and a price which allows it to be within the reach of just about anyone. Mahogany is one of the most revered tonewoods in the history of guitar making, with a rich, deep sound and a long tradition at Gibson USA, and it remains the cornerstone of the SG J. A neck made from hard-wearing maple is glued into the body and carved to a fast, slim 50s profile that measures .818 at the 1st fret and .963 at the 12th. It is topped with a genuine rosewood fingerboard that carries 24 medium-jumbo frets to extend your playing reach, and elegant pearloid dot inlays. Unlike most SGs, this is a two octave guitar. You can see there is no pickguard used. The stripped down look is perfected by leaving out a pick-guard. Like all new Gibson guitars, however, PLEK technology is used to cut the corian nut and and perfect the set-up. Rather than spend for mother of pearl Gibson inlay on the head-stock, here we have a Gibson silkscreen logo. The Gibson SG J sells for just $599. The problem I'm seeing is there aren't many of them out there for sale. What a wonderful thing it must be should you be able to find one used with some scratches on it, in such a case you'd likely be able to purchase the guitar for well less than it sold for originally. Apparently these guitars were discontinued, as I can find no listing for 2017 models. The Gibson SG Faded appears to be the exact same guitar as the SG J, but with a pick-guard and uncovered pickups. There is more to it than just that, however, as the SG Faded has a mahogany neck instead of a maple neck, with 22 frets. The pickups are the same, they are just uncovered. Do covers over pickups affect tone? Most people will tell you they do, in fact, affect the tone. You may or may not have the precision hearing ability with which to detect it. Lots of folks will also tell you the pickup covers are there for a reason, and the reason is to protect the pickups. 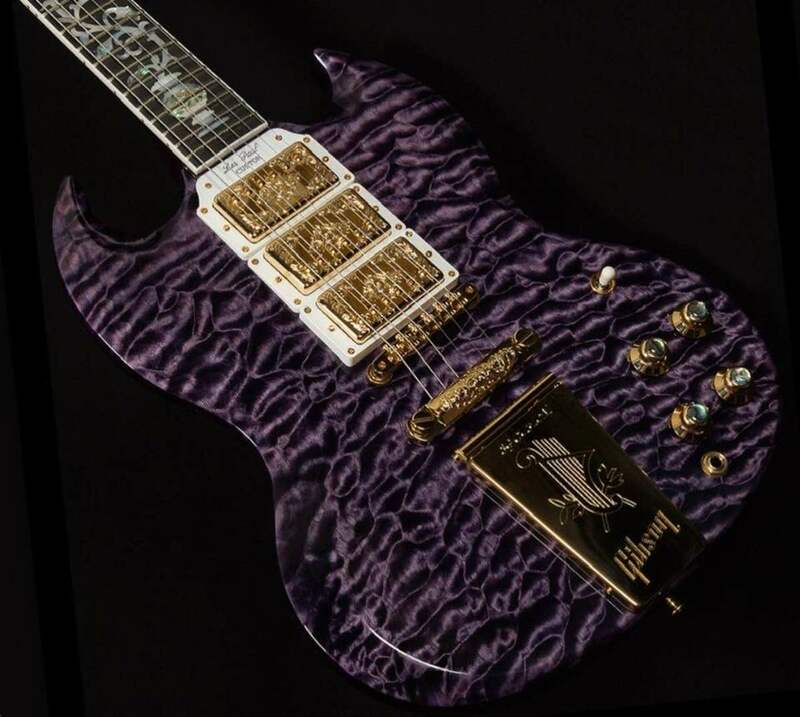 Well, they come uncovered on the Faded SG, or you can have them with chrome, gold, or nickel covers. Cranking all this tonewood and superb playability to the max is a pair of Gibson's most popular humbucking pickups from the Modern Classics series: a 490R in the neck position, and a 490T in the bridge. The SG Faded's 490R neck pickup, with its neck-spaced pole pieces, is carefully calibrated to match the bridge-spaced 490T bridge pickup for a perfect combination of warmth and bite. The 490R and 490T come mounted with two-conductor wiring from the factory. But you can add four-conductor shielded pickups for series, parallel and split coil variations. The Gibson SG Faded is one of Gibson's most popular models. This Gibby gives you everything Gibson is famous for in terms of build and tone, and does it all for well under a thousand dollars. The list price is just $739, and so you know on the used market they go for even less. Width at 12th Fret: 2.062"
Thickness at 1st fret: .818"
Thickness at 12th fret: .963"
Maybe the first thing you notice about the Gibson SG Special is its fancier finish options. Or it could be you notice that teardrop shaped pickguard. The one thing you should absolutely notice is those aren't P90 pickups, and they aren't PAF style humbuckers either. These guitars are more commonly called a Gibson SG Special T, but they are, in fact, a 1970's tribute guitar. They are a remake of the SG Specials from the 1970s, and they feature the Gibson mini-bucker pickups. These pickups are extremely well regarded. These dual-blade Alnico pickups are calibrated for separate neck and bridge versions to ensure a balanced output. They are an improvement upon the original mini-bucker pups Gibson used in the late '60s and '70s. The Gibson mini-humbuckers can be said to have more definition of notes than their full sized humbuckers do. At the same time, you could say their tonal character is fatter than even the P90 single coil. A P90, of course, is fatter physically and tonally than a Fender style single coil. My opinion is mini humbuckers are tight, bright, compressed, and really cut through. They are half dirty sounding and aggressive, they also clean up wonderfully for your clean tones. These Gibson SG Special Ts come in four finishes. The silver burst, a sun burst, satin black, and satin cherry. These guitars have a maple neck instead of a mahogany one. The small block inlays are very damn cool, in my opinion; and I personally like them a bit more than the larger trapezoid inlays. These guitars are currently listed at just $739 dollars in places. Some folks are asking more, but you can probably bring them down to the list price if you try. 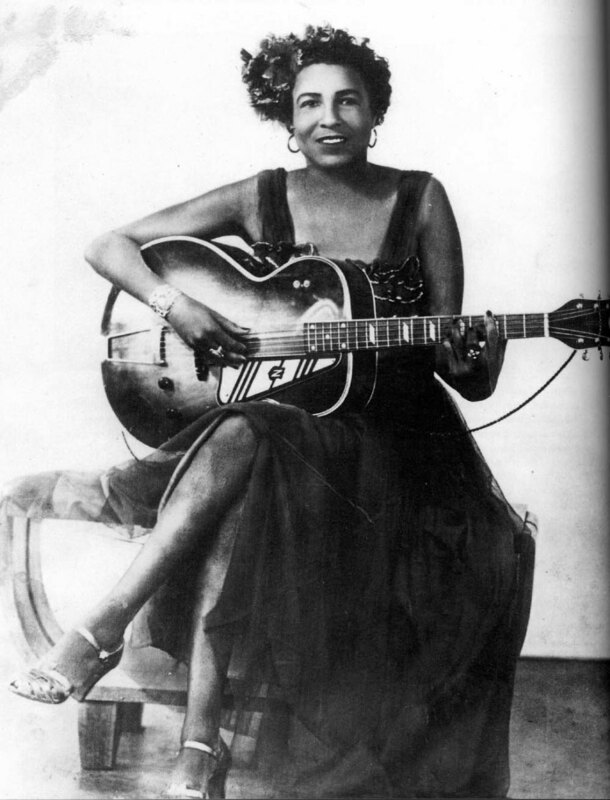 2014 marked Gibson's 120th anniversary, and so Gibson did some interesting instruments that year. The SG Futura is another one of those. This is a maple neck SG with a two octave fretboard; but those are hardly the only special characteristics of this instrument. This guitar has Gibson's Min-Etune system. Min-ETune is a small compact battery powered tuning unit that sits on the back of the guitar. You can still adjust the tuning pegs manually or turn on the Min-ETune to choose from 12 popular tunings or program six of your own. Some folks love the thing, others not at all. Electronics include the P-90H Sidewinder and burst bucker 3 with Push/Pull for coil split and mini toggle for 15dB boost. This SG Futura benefits from the full array anniversary bonuses including max grip speed knobs, a Graph Tech nut and chrome tune-o-matic bridge. It also comes with a case. You don't normally get a hard shell case from Gibson at under a thousand dollars. These guitars were originally priced at $899 dollars. What I'm seeing are people asking more for them. It just goes to show how if you buy up some of these limited edition Gibson guitars and hold on to them, even a year or two later they can be worth more than you had paid for them. . The Gibson SG guitar did not exist at any time during the 1950s. Gibson doesn't consult me for the names of their editions, obviously, but regardless, they've determined to call this fine guitar a '50s tribute. If you look you can see this SG offers two P90 pickups. Gibson's P90 single coil pups are something to really dig into. They're quite unlike Fender style single coil pickups. This is another SG which came with the Min-Etuners. It also has a two octave neck. Lets just forget that never in the 1950s did Gibson produce robot tuning machines and two octave necks. So far as I can find out, all of these guitars were produced in 2013. 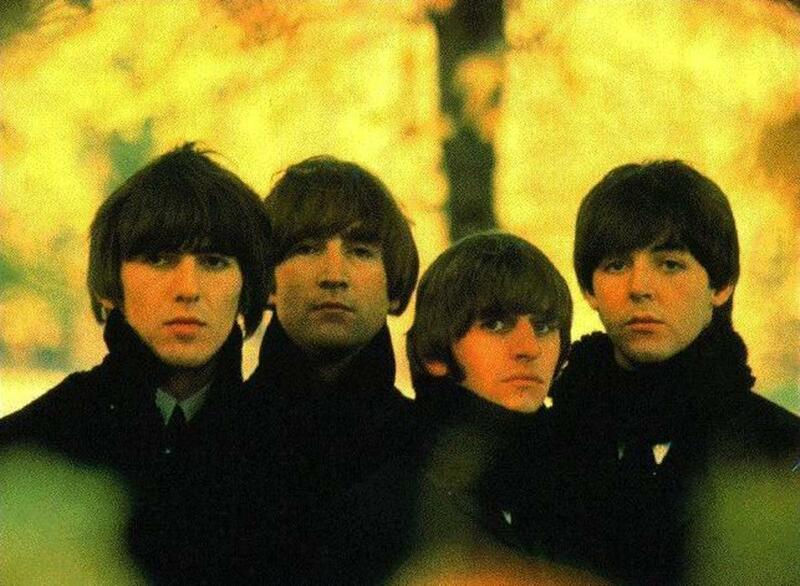 You can find them used on well known and regarded sites like Reverb for around six hundred and fifty dollars. These guitars sold for $899 dollars new. You have to admit the combination of a two octave fingerboard and P90 pickups is a smart combination, though the title of the edition is quite dumb. Pete Townshend would have absolutely loved to have had one of these during the 1960s. This guitar does have a legitimate 1950s Gibson neck profile. This means this SG has a fatter neck on it than other SGs will. One of the reasons Les Paul objected to the SG was he felt the necks of the ones built in 1961 were way too flimsy. I reckon Les would more readily approve of these SGs with the '50s profile necks on them. The Gibson SG '60s Tribute guitar is much the same as the '50s Tribute, but with humbucker pickups and a different profile neck. The '60s profile neck is much slimmer than the '50s profile neck. Some folks will say the thinner neck is 'faster,' but this all really depends upon the size of your hands, and how comfortable the guitar feels in those hands. The Min-ETune robot tuners are on these guitars. A person is likely to find those to be highly annoying, or super cool and useful; but if you love the way the guitar feels and sounds, those strange tuning machines will almost certainly grow on you. In keeping with the stripped-down ethos of this powerful performer, both body and board remain unbound, and there is no pickguard to obscure the finish. A PLEK-cut nut made from black Corian„ subtly complements the black speed knobs and black pickup rings. The traditional back-angled headstock is silkscreened with gold Gibson and holly logos. What is really special about this particular guitar is it is packing Gibson Burstbucker pickups. The Burstbuckers are very hot, and widely desired. These are some of the most popular and acclaimed pickups Gibson makes, and truly, Gibson only makes great pickups. These adhere strictly to Seth Lover' original formula, which includes a genuine Alnico II bar magnet in each pickup and slightly mismatched coils wound with 42-AWG enamel-coated wire for the characteristic edge and bite that has made original PAFs legendary. These guitars were produced in 2013. They originally were priced at $899 dollars. It's not impossible to find them for less than a thousand dollars today, but because of the pups and the two octave neck, these guitars are selling for more now than when they were first for sale. 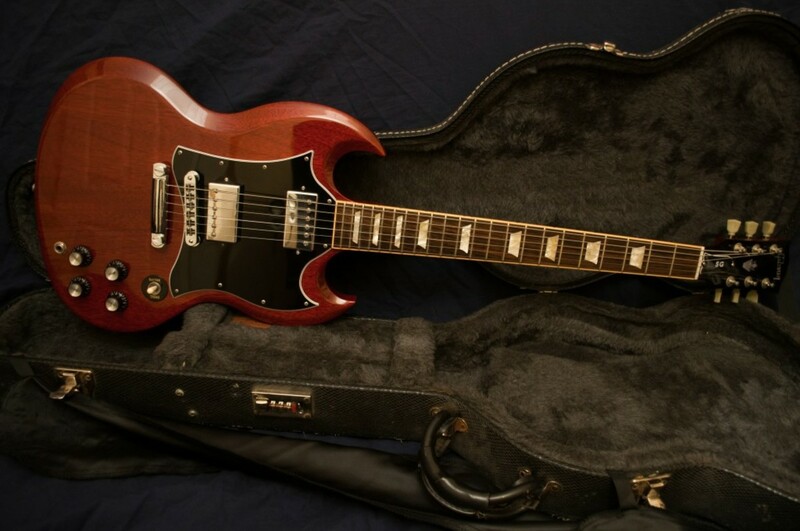 The Gibson '70s Tribute SG is another no pickguard, two octave SG. The only thing one can easily say is different, visually, from the '60s Tribute is the pickups are uncovered on the '70s Tribute. This guitar, however, is different in many ways; and primarily the differences are in the neck and fingerboard. Like many great Gibsons of the '70s, the neck is made from maple and carved to a profile unique to the era, which measures .800" deep at the 1st fret and increases to .963" at the 12th, with a volute behind the nut to both strengthen the headstock joint and enhance neck resonance. A chocolate-brown baked maple fingerboard carries small block inlays, and terminates in a PLEK-cut Corian nut with a width of 1-11/16". It can be challenging to believe that rosewood colored fingerboard is really maple, but such things can be done, and they are done here. 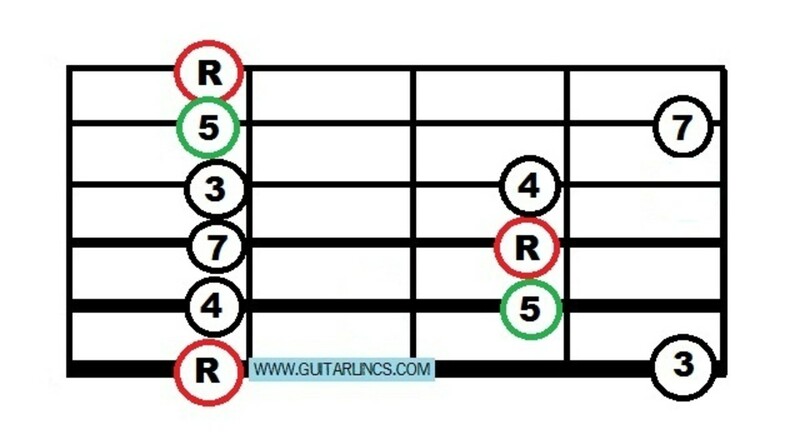 The tone of a guitar is affected by the fingerboard, and you shouldn't believe anyone who tells you otherwise. That all said, the major tonal contributor to any solid body electric guitar is the pickups, and this guitar is using Gibson's Dirty Fingers pups. Dirty Fingers pickups aren't new, but they had spent 20 years out of production. They're back again, and they are acclaimed for their very high output. They drive an amp to distortion more readily than other Gibson humbuckers. These pickups and any guitar packing them are most suited to crunch, but their clarity is also something widely praised. The Gibson SG Special 2017 T is the perfect guitar for the player who desires vintage looks and authentic Gibson tones, but also wants to get the best that Gibson's modern construction methods have to offer. A satin finish, nickel-plated hardware, and vintage-style keystone tuners give this SG Special the traditional vibe that we all love. 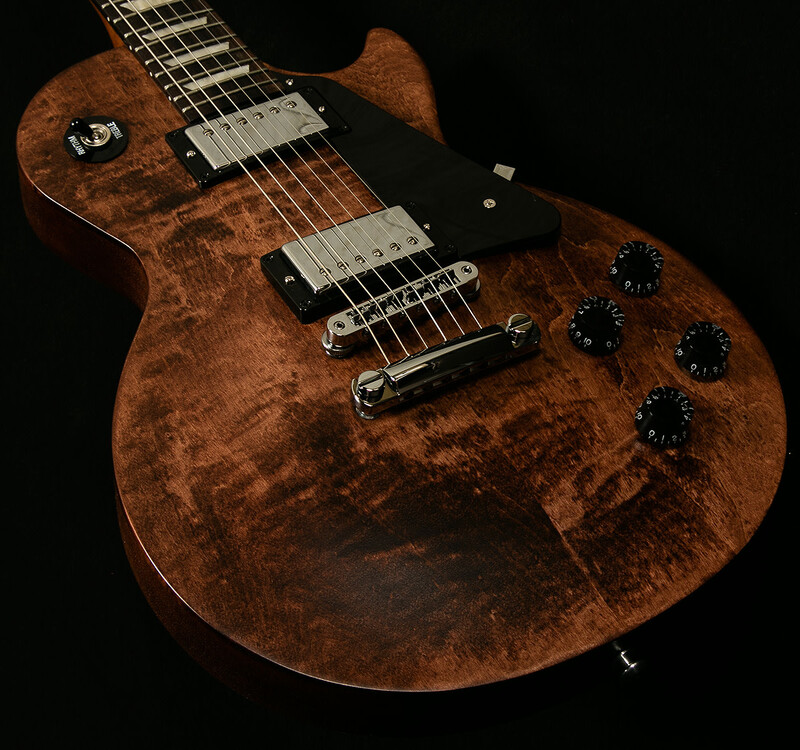 Its slim-taper neck, modern pickups, and small-block inlays suit it to today's most demanding players—and it all comes at an incredible value for a genuine American-made Gibson guitar. With the 2017 Special you get a two octave fingerboard. Gibson seems to be moving towards making the 24 fret neck the standard on SG guitars. Seems like a good thing to do, with the double cutaway, one has so much access a bit of an extended range could only sweeten the deal. More and more players are demanding standard two octave necks, and Gibson shouldn't think itself insulated from changing desires. The Gibson Government series guitars all commemorate the sad occasion when the US Federal government decided to raid one of the USA's oldest and proudest manufacturers of musical instruments. Gibson musical instruments are sought after all over the planet, so it is clearly absurd that the US government would assault such a proud and global representative of United States manufacturing. Gibson CEO Henry Juszkiewicz had donated large sums of money to the campaign of President Obama's opponent. Whether or not you think the raid on Gibson was political is up to you to figure out, but in any event, every piece of material confiscated from Gibson was returned to them, although they did have to spend big money in courts of law to get their property back. Hey, it's just good capitalism to capitalize on such events, and make commemorative products. 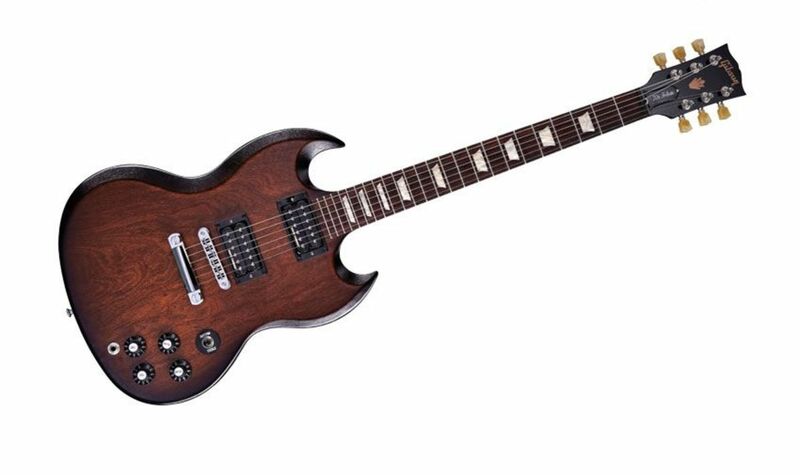 The Gibson Government II SG was priced at $999 dollars new. It's a very traditional SG with mahogany neck, and a 22 fret one at that, and basically, everything is set to SG norms except for the grey finish, and the commemorative emblem. The pickups here are the Gibson Dirty Fingers pickups, a very high output set which seems to be most suited to loud and angry barking and growling tonal assaults. The neck used is the fatter '50s profile neck, so this guitar is similar to the '50s Tribute SGs in that particular. It won't be the slightest bit surprising to see not just this Government Series II SG, but all Gibson Government series guitars become highly collectible in the future. Expect prices to rise for these. In fact, my thinking is a lot of them were probably bought up and stored away, barely played, if played at all; as investments. Guitars are meant to be played, and I hope that should you acquire one of these you do play it loudly and proudly. This guitar also comes with a hard shell case, be certain you receive that should you buy one. Plastics: Black pickguards with Government series logo hot stamped in gold. The Gibson SG Standard is the single most successful product Gibson has ever produced. Gibson has sold more of them than any other instrument, even more than the Les Paul. But the Gibson SG started its life as a new version of the Les Paul. Ted McCarty and crew designed the thing, and its never left production since because it's simple, relatively affordable, attractive, ergonomic, and so instantly recognizable. 2017 is upon us and the most common price for a brand new Gibson SG Standard is $1,299 dollars. Even the blemished ones sell for over a thousand dollars, but as a guitar which has been in production since 1961, you'd best believe there are a lot of used ones out there. An SG Standard which is five years or more old, and has been played a lot will have some scratches, some dings, and lots of character, and they'll generally be selling for under a thousand dollars. Looking online you can find the Standard in very well kept form for $999 bucks, and that is going to include binding, fancy fretboard positioning markers, coil taps, and a hard shell case. It's also going to have some heart and soul, and a huge lot of American tradition. I hope this page has been of service to you, thanks for reading. I too like the feel of the SG compared to the Les Paul especially, Wesman. Although I played the LP many times during performances it was always too heavy for my taste. I never was satisfied with any of my Strats either, even the American made ones. I suppose everyone is different in their own preferences. Thanks Randy! I hope to buy sometime in the first part of this year. If things go well I'll have me a nice electric and small amp soon. Another great review of a wonderful guitar, Wesman. I've owned a Silver Anniversary Les Paul. but always wanted an SG. You've given me several options to choose from in this well written article. Thanks for the fine research!